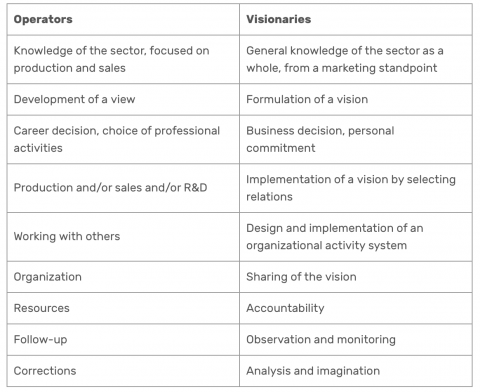 This table on Operators’ vs Visionaries’ Managerial Activities really made me think. It’s from a Canadian research paper on two kinds of entrepreneurs as leaders published in 1998 by Louis Jacques Filion, blogged by John Maeda. If you’re not part of the solution you’re still part of the problem, according to Yvon Chouinard. That’s why the Patagonia Founder Chouinard leads by example, lives a simple life consuming only what’s necessary and uses all his resources to protect the environment. A remarkable man. I am thoroughly fascinated by Yvon Chouinard, founder of Patagonia. Yvon is a legendary climber, businessman and environmentalist. I can’t remember when I last highlighted as many paragraphs as in his book Let My People Go Surfing: The Education of a Reluctant Businessman. Mr. Chouinard makes me think about my values and how I run my businesses. The world needs more leaders like him! I would like to create an extensive list of entrepreneurs that have values we can look up to. I refuse to believe that in order to super-successful you have to be ruthless and unethical. I want to believe that (business) success can be built on respect, kindness and decisions that don’t always come down to money. Yvon Chouinard fits that category. Who else? In this talk, Mr. Chouinard talks about his personal history, how he created Patagonia, and the philosophy he uses to run the company. He discusses how he has tried to minimize Patagonia’s impact on the environment, such as making fleece clothing from recycled soda bottles. He also talks about his One Percent for the Planet plan in which participating businesses contribute at least 1% of their net annual sales to groups on a list of researched and approved environmental organizations. I also recommend this article about Mr. Chouinard over at Inc Magazine.